For centuries, architects and builders have chosen tile for its beauty and durability. Roof tile adorns notable buildings throughout the United States, including the Empire State Building, Colonial Williamsburg, Ellis Island, AT&T World Headquarters, and many Frank Lloyd Wright residences. 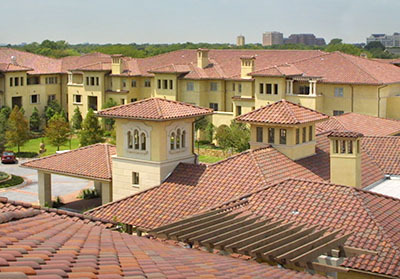 Roof tile may be worth considering for your next commercial, residential or institutional project. A tile roof typically lasts well over a century and is backed by manufacturers' warranty programs. Our tiles are Grade 1, suitable for virtually any climate, with some of the highest cross breaking strengths in the business, from 300 to over 1,000 pounds. Clay or concrete roof tile comes in a variety of standard shapes, fittings, sizes, colors, textures and surface treatments, and is available in matte, gloss, weathered, fire-flashed, sanded and combed finishes, so your roof can truly become a work of art. It can also be easily customized, with color and profile matching for additions, renovations and restorations.